Faculty and students gathered at a panel event Tuesday to discuss how their work with Harvard’s Center for Hellenic Studies is helping to expand the University’s presence in Greece. One of a series of events showcased during Harvard's Worldwide Week, the panel addressed the role of an international center in supporting Harvard’s global outreach efforts. Founded in 1960, the Center for Hellenic Studies stands as a research and educational facility that brings together various research and teaching interests focusing on the Hellenic civilization. Gregory Nagy, a professor of comparative literature and the director of the Center for Hellenic Studies, said the Center’s new initiatives are increasingly multifaceted, with emphasis on public service. “We’re like a global version of the Phillips Brooks House Association,” Nagy said. Nagy added that the Hellenic Center hopes to incorporate its academic pursuits with its public service aspirations by providing students with a chance to teach students in Greece. “It’s really rewarding to become a mentor to students in Greece, and I still keep connections with them,” said Allison C. Toledo ’19, who participated in the Center's Teaching Internship Program. 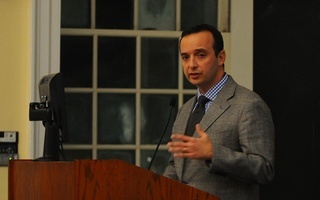 Nicolas Prevelakis, a lecturer on Social Studies who moderated the event, said he is grateful for the University’s presence in Greece and the work it does for the community there. According to Prevelakis, the international office in Greece attracts thousands of visitors and is open every day. Rhea K. Lesage, librarian for Hellenic Studies, said the Hellenic Center launched a new initiative last February to create an international collaboration between the National Library of Greece and the Harvard Library collection. Friday, January 14. **MORNING PRAYERS. Rev. C. E. Park. Subject: "A New Heart." Appleton Chapel, 8.45 A. M. *UNIVERSITY TEA.